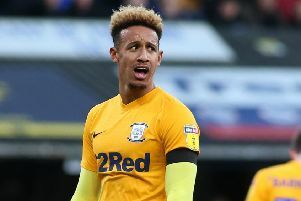 Callum Robinson’s emergence as a central figure at Deepdale was perhaps the highlight of Preston North End’s season before his injury. The striker was in the form of his life, scoring 10 goals and being called up by the Republic of Ireland, having elected to represent the country of his maternal grandmother at international level. Unfortunately that was all to come to an abrupt halt when he limped off in the 4-1 win over Blackburn Rovers on November 24. In a season blighted by injury, PNE’s worst fears were realised with the news that their top scorer was to be sidelined until March after needing surgery on a hamstring problem. North End have certainly missed their main man in recent weeks, the 23-year-old of course not being the only key player unavailable to Alex Neil with several short-term injuries adding to the season-long absences of Billy Bodin and Josh Harrop. But in the 10 games since Robinson has been in the treatment room, the Lilywhites have scored more than one goal in a game just once, the 3-2 win over Millwall on December 15, also PNE’s last win in all competitions. There have, however, been just the two blank scorelines, in the 3-0 humbling at Birmingham City and the 1-0 reverse at Sheffield Wednesday, Ben Pearson’s red card hindering North End’s efforts on the road at Hillsborough just before Christmas. In terms of form this period has also coincided with just the two wins, the back-to-back victories at Nottingham Forest and at home to the Lions. Few expected Preston to make such a free-scoring start to the season but that as certainly slowed, admittedly at a time when Neil’s striking options have largely been limited to Lukas Nmecha, the Manchester City loanee very much learning on the job during his first full season of senior football. While Robinson leads the way on 10, Alan Browne has eight goals and Tom Barkhuizen six, with both Daniel Johnson and Louis Moult on five. Options have been bolstered by players returning from injury this month and the arrival of new signings Brad Potts, Jayden Stockley and Josh Ginnelly. Despite Robinson’s continued absence, that would point to PNE getting back towards their prolific form in front of goal in the early part of the season. As things stand, 39 goals in 27 games means they average 1.44 goals per game compared to the Championship average of 1.33.